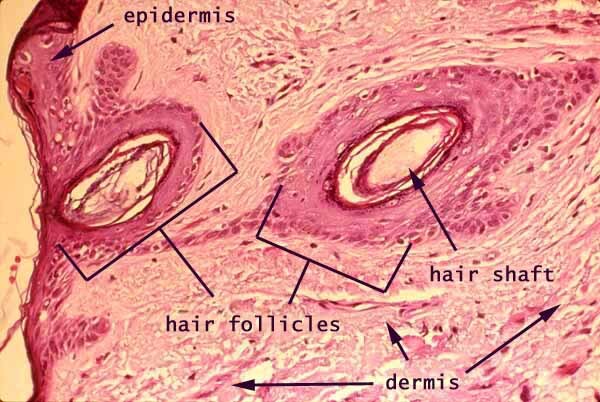 This image shows hair follicles near the surface of skin, surrounded by fibrous connective tissue of the dermis. Hair follicles typically appear as oval (like this view) or elongated structures with a thick wall of stratified squamous epithelium and a central lumen that may (or may not) contain a hair shaft. The hair shaft is attached only in the bulb at the bottom of the follicle, so when the tissue is sliced to prepare a slide, the sectioned bit of hair may fall out. The appearance of hair follicles varies considerably, both with depth in the dermis and also with growth phase. Consult a histology text for details. Much of the area of this this image is occupied by connective tissue of the dermis, consisting of collagen (pink), ground substance (pale background), and scattered fibroblasts and other connective tissue cells (dark). To view this region in a larger context (low magnification) click here or on the thumbnail at right.